Selected, no doubt, for its obscurity and anonymity, Monrovia is an agrarian community that probably houses more hogs than people at any given time. It’s a deep red town in a deep red state. God and guns are everywhere. Wiseman shows us a T-shirt, sold by a vendor at the annual Monrovia Festival, that reads, “I have a pretty daughter. I also have a shotgun and an alibi.” Elites on the coasts scoff at such hillbilly humor, but Wiseman never judges. His is one of the last objective cameras in a genre largely overtaken by agenda journalism. Wiseman has long seen places, not people, as the protagonists in his docs, and Monrovia, his 47th film, finds the director in peak curiosity, inventorying every square inch of the unremarkable town. Whereas the average documentarian would set about arranging interviews with, say, the mayor or councilmen or the high school principal to learn about a town, Wiseman’s Direct Cinema approach has not changed in 50 years: He is an invisible accountant, recording life for posterity, never intervening, never commenting. Indeed, Monrovia, Indiana brings documentary filmmaking to its purest roots. It’s a silent-film-era city symphony, only without the musical score — an ethnographic survey of a place and time. 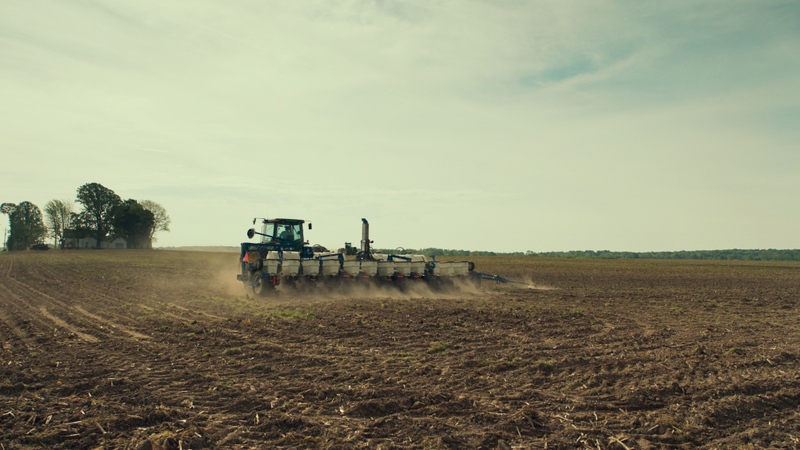 Wiseman cuts quickly between fields both barren and fertile, houses both lower-class and middle-class, crooked mailboxes and jumbles of farm equipment — glancing politely, but never lingering, on these familiar scenes of Midwestern ubiquity. He films Monrovia’s tiny downtown, with its pizza joint sidled next to a tattoo parlor, so many times that it begins to feel like a familiar haunt. Wiseman also shows us dirty cows in inhumane conditions, and pigs herded toward their slaughter. This is hard to watch for some of us, but it’s life, and death, in Monrovia. If we cluck our tongues, we’re missing the bigger picture. Ditto the inevitable scene in Monrovia’s gun and ordnance shop, which swiftly disarms the prejudices of the antigun left. The store comes across not as one of many local enablers of domestic terrorism but as a kind of Town Square, where everybody knows everybody, and the conversation is less about capacity and recoil than it is about sports scores, the ripest fruit in season, and which acquaintance just had his gall bladder removed. It is, in other words, a place of fellowship and entertainment where we city folk wouldn’t expect to find it. The same could be said for an auction of expensive farm equipment, which draws a crowd of attendees to the local gymnasium, where the hulking combines are driven onto the court, gleaming like runway models. That most of the residents won’t raise their bidding cards is hardly the point. Then there’s the mattress sale at, presumably, the same gym, in which families cavort on the various king- and queen-size slabs. It is, for lack of a better phrase, something to do. Then there’s the nitty-gritty of civic policy, the circular tedium of debating procedure around a conference table. No one in film history is as interested in this as Wiseman. His PBS doc State Legislature featured more than three-and-a-half hours of this back-and-forth from the legislature in Idaho; in last year’s Ex Libris: The New York Public Library, meetings of library system leadership anchored and contextualized the movie. A similar grounding arises from the handful of times Wiseman eavesdrops on town council meetings, where the top items on the docket include jurisdiction of Monrovia’s water supply and a second entrance into a still-controversial residential development that may soon expand the town’s population. As in many tight-knit communities, growthers and no-growthers vie for ownership of the town’s soul. But the topics of discussion are almost irrelevant; what’s more important is that we’re witnessing governance at its most granular, liberated from the stagnation and corruption of the state and federal levels. Under Wiseman’s lens, Monrovia is a place that hasn’t changed much since the introduction of agribusiness, but there’s a humble beauty in its sleepy, folksy, God-fearing rhythms. We see a baby shower, a church wedding and a church funeral; Wiseman ends his movie with the latter, as a charismatic preacher leads the mourners through “Amazing Grace.” Then, dirt is shoveled and the casket is lowered into the ground. It’s the sort of sequence that, like much of Monrovia, Indiana, obliterates all big-city snark and cynicism and politics. The corn grows, and so does the cemetery population. Life goes on, until it doesn’t. MONROVIA, INDIANA. Director: Frederick Wiseman; Distributor: Zipporah; Opens: Friday at Lake Worth Playhouse.